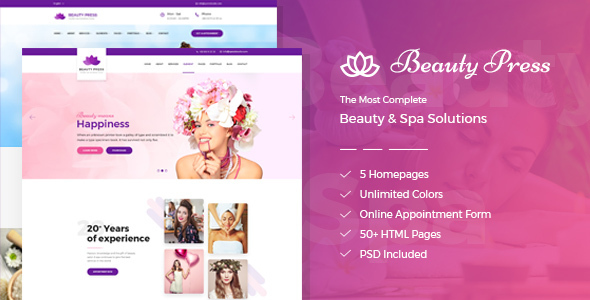 BeautyPress – Beauty Spa Salon Wellness Html Template is a clean responsive Html Template specially built for Beauty, Spa, Salons, Yoga, Barbershop, Care, Hair, Health, Massage, Medical, Physiotherapy, Wellness Center, Makeup, Cosmetic, Treatment. BeautyPress includes great features for this templates Like 5 homepage design, Unlimited Color, Appointment form. You can choose the best design that fits more to your needs, depending on the type of your beauty shop, wellness spa, spa shop or other.